LeapRate Exclusive… LeapRate has learned via regulatory filings that FCA regulated Forex and CFD brokerage GCM Prime Ltd has seen a drop in Revenues and a virtual evaporation of all client money held at the company during 2017. On the top line, Revenues for 2017 at GCM Prime were down 25% to $2.1 million, versus an annualized $2.8 million in 2016. (GCM Prime reported $2.09 million of Revenue during the 9-month period April-December 2016). The company posted a loss of $3.2 million for the year. In May 2018, the company’s shareholders put an additional £1.3 million of capital into the company – by year-end 2017 GCM Prime had an accumulated net loss of $7.8 million, draw down from paid-in capital of $11.1 million. 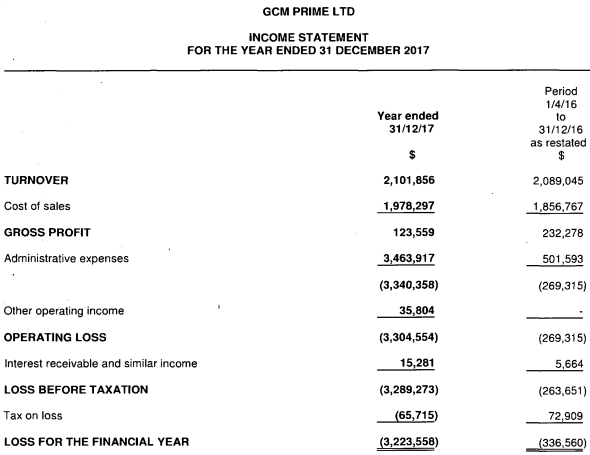 Also interesting to note was that client money held at GCM Prime went from $12.4 million as at year-end 2016, to just £98,667 by the end of 2017. The growth in client cash in 2016 was largely due to the acquisition of a large book of institutional clients in September 2016, acquired from CMS UK, which also included ownership of trading names including CapMarFX, CapMar Financial and CMSFX.co.uk. The company continues to also use the Capmar Financial trading name. GCM Prime, as was stated in articles written, suffered contagion from false rumours and reporting from several FX news portal websites in the aftermath of the Gallant Capital Markets bankruptcy filing. These circumstances adversely impacted its business relationship with hard acquired and long established prime of prime clients. As a result of this material change in business, the company decided to restructure. This action required asking clients to migrate their trading account to other brokers and a corresponding precipitous drop in client assets held with GCM Prime. The stated large losses in the 2017 financial statements is a result of a major write down of assets acquired in September 2016 from Capital Market Services UK Ltd.
GCM Prime Ltd used to be known an AlumFX, an inactive retail forex broker which was acquired in 2015 by forex entrepreneur Salvatore Buccellato, via his US holding company Prime Trading Holdings Corp. GCM Prime was then relaunched in late 2015 as an FCA regulated service provider to Retail Forex brokers, providing liquidity solutions, full white label broker solutions, and Prime of Prime services. Salvatore Buccellato continued to run his own offshore retail forex brokerage called Gallant Capital Markets Ltd, based in the British Virgin Islands. Gallant Capital Markets filed for Chapter 11 bankruptcy protection in the US in 2017.